Why does it feel as if spirituality is treated like a separate entity at times? Almost as if it were another thing to tick off a long list of things to do throughout the week. Establishing and maintaining our spirituality is an intimate process, which each one of us determines in our own way. By incorporating our spirituality, whichever form it may be, into all our endeavours, this facilitates the space for a regular engagement with God to take place. The culture and history of the Chokwe people offers a great example of the close spiritual connections established and maintained in everyday life and highlights the presence of creator in all aspects of Chokwe society. The Chokwe people, have inhabited north-eastern present-day Angola as well as regions in Congo and Zambia since the seventeenth century. In his remarks about spirituality in Chokwe culture, Angolan artist Chikukuango Cuxima-Zwa notes “the term God among the Chokwe is thus not only the creator of the World and its people, but also of a basic element of the social fabric.” For the Chokwe, God is represented through ancestry and present in all aspects of everyday life as well as in key life milestones. The high-regard for ancestry and regular engagement with various ancestral spirits provided a platform to connect to God as well as understand self, which draws attention to the important role that spirituality played in shaping the Chokwe social structure. Sculptures and everyday items – When commenting on artefacts and its links to wider Chokwe society, Anthropologist Daniel J. Crowley commented “their sanguine approach to life is evidence by their attitudes towards the arts, which traditionally were incorporated into every major aspect of Chokwe culture”. From Sculptures to household items including hairs combs, chairs as well as pottery and baskets, all played a part in representing Chokwe cosmology. Most items depicted some part of ancestry, through this close association to spiritual ancestry this was thought to invoke success as well as continuity. These items show how God was visually present in many features of everyday life, all of which nurtured a sense of alignment and balance. Transition in life – There were many moments in an individual’s life that provided space to engage with God. One example of this can be seen in Mukanda (the ceremonies initiating Chokwe boys into adulthood), this involved boys entering a secluded space away from the village to reflect on their childhood and life thus far and prepare for a rebirth into adulthood. Special walking sticks, depicting Chokwe ancestry, were given to boys as they ventured back to their community, now as men to symbolise the continuity of life. The Mukanda also features the strong presence of Pwo (masks depicting female ancestral spirits) to pay homage to womanhood and the female essence. In his essay Revisiting Pwo, Manuel Jordán describes the mask as sharing “the positive influences of the ancestral spirits with the community”. The Mukanda offers an example of the high regard placed on connecting to spirituality in the process of transition and growth. 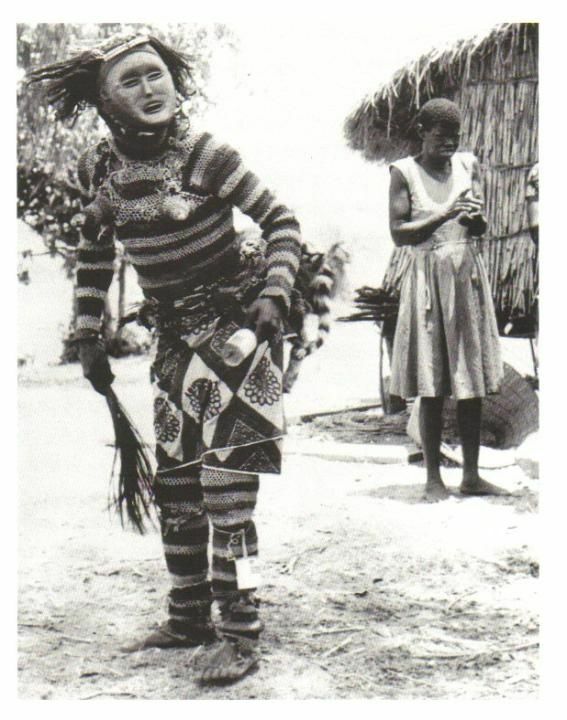 The examples indicated point to the strong spiritual connections that shaped many features of Chokwe society. For the Chokwe, having God present in all aspects of life ensured continuous dialogue and engagement with spirituality. A lot can be learned from this approach in the process of knowing ourselves better. Exploring our spirituality provides an opportunity to connect with our core and be guided by it in all our endeavours. The clarity we get from understanding our purpose and nurturing our faith and efforts into realising this purpose is an empowering feeling, may we all create the space to achieve this.